The other side of the engine house, six years on, in August 2013. 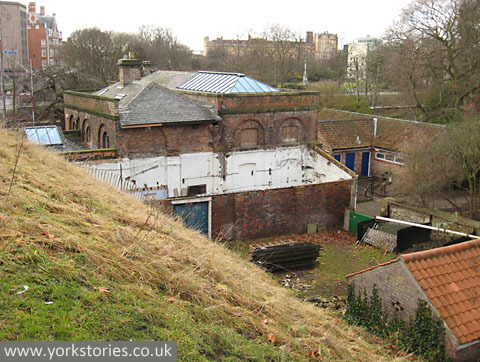 In case you’re wondering where it is, here it is in its context, pictured in January 2011, from inside the Museum Gardens, from the bank of the city wall. That short stretch we tend to forget is a section of city wall, heading towards Lendal Tower. In the distance, on the left, the former railway offices across the river. To the right, the Museum Gardens. 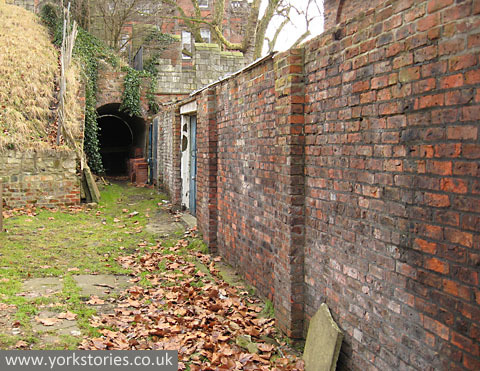 Near the engine house, to the left, is the toilet block, demolished as part of the work taking place here. I’m not in the mood for a history lesson, though the history of the engine house is interesting, instead I’d like to mention that this was one of my favourite forgotten corners, behind the engine house, all peeling paint and piles of old fencing and ivy and weeds. 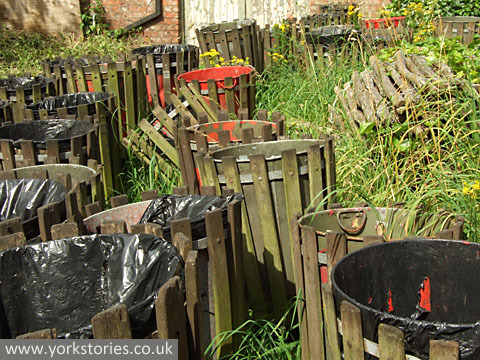 In the summer of 2007 the land behind the engine house seemed to be a bin graveyard, with disheveled ranks of 1970s style bins. 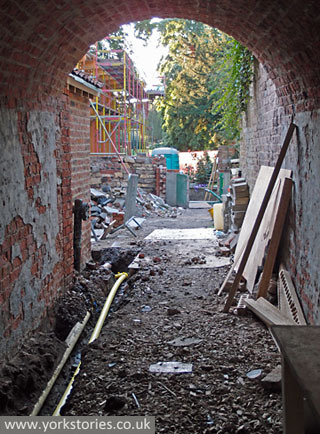 Cut into the bank of the city wall, a short tunnel, an archway, here stuffed full of more junk, in the summer of 2007. Lendal Tower itself and the houses in its shadow were refurbished, but the engine house remained empty for many years, with the proposed redevelopment as a restaurant apparently stalled. But this year it’s all started, the transformation of this place. It’s not a quiet corner now, but full of activity and cement and steel and men in hard hats. 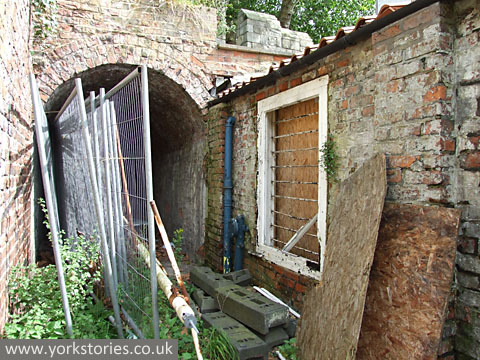 The door in the archway is open, and passers-by on the slope down to the river next to Lendal Bridge can see the work taking place around the engine house. And here’s what they’ve been making. Photo taken a couple of days ago from the riverside walkway near Lendal Bridge. 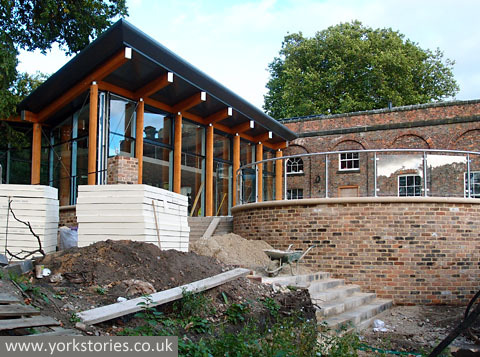 The old engine house in the background, with a new extension to one side (where the toilet block used to be). All part of The Star Inn the City, opening this autumn. So much more could be said, but perhaps readers can share their thoughts. I know many people who read these pages are now many miles away, but like to keep up with changes and developments. 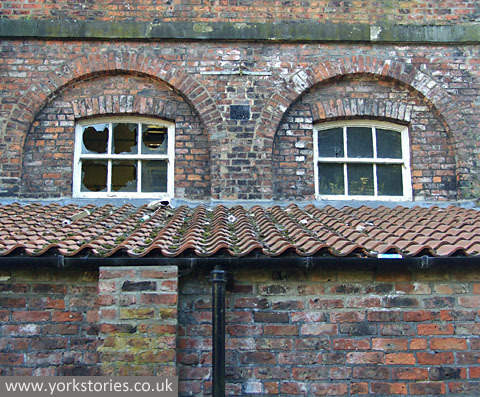 This, so close to Lendal Bridge, is I think an important one, after the engine house was empty for so long. 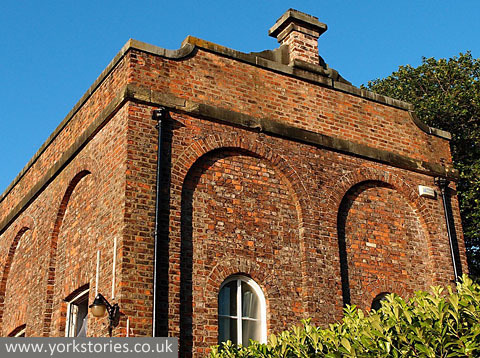 Many readers will know the building as the offices of York Waterworks. I’m interested, as always, in our more recent history, the meanings buildings have to residents, and the stories connected to those buildings we perhaps take for granted, like this one. So please add a comment if you have information to share.